Personal reasons see Jordison bow out. 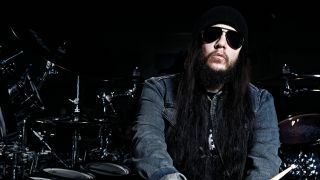 Joey Jordison has parted ways with Slipknot. In a statement, the Iowa metal icons pointed to personal reasons being behind Jordison's departure. Slipknot said: "It is with great pain but quiet respect that, for personal reasons, Joey Jordison and Slipknot are parting ways. We all wish Joey the best in whatever his future holds. "We understand that many of you will want to know how and why this has come to be, and we will do our best to respond to these questions in the near future. Earlier this year we spoke to Joey about heading back into the studio with Slipknot. He told us that the band's new record was going to be their most brutal ever, saying, "I think it will be because of the time that has lapsed between records. With this record, I don't think we're going to play it safe at all." Joey is currently out on tour in the UK with Scar The Martyr. For more on this news as it breaks keep an eye on Musicradar.com/rhythm.